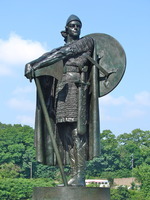 BJARNI, HERJÓLFSSON, first European to sight the east coast of North America, son of Herjólfr Bárdarson, one of the early settlers of Iceland, and his wife, Thorgerdr; fl. c. 986. Bjarni was a part of the remarkable migration which in the tenth century established Norse settlements in Iceland and Greenland, and almost inevitably therefore reached the shores of mainland North America. The Saga of the Greenlanders relates that Herjólfr, Bjarni’s father, sailed to Greenland with Eirikr Thorvaldsson (Eric the Red) in 986 when the latter led a group of settlers to the island and founded an Icelandic settlement there. At this time Bjarni was a merchant who spent each summer abroad trading in Scandinavia, returning to Iceland in the autumn to spend the Yuletide with his father. When he reached Iceland in the late summer of 986 he was greeted with the news that his father had emigrated to Greenland. Immediately he set sail thither, but met with stormy and cloudy weather and was driven off course for several days. When the weather cleared he sighted a land which he described as wooded and having low hills. Bjarni said this could not be Greenland and sailed north for two days, when a second land – level and wooded – came into view. Bjarni did not stop there, but continued on a northward course for three days when he sighted a mountainous land covered with glaciers. Because Bjarni did not believe this to be Greenland, he sailed away from it. After four days he sighted a country which he declared answered the description given him of Greenland and by a stroke of fortune he landed at his father’s estate. Scholars have disagreed as to what parts of the coast of America Bjarni saw and indeed as to whether there is any factual basis to the narrative. In recent years, however, the historicity of the Saga has been increasingly admitted. There are strong arguments for the view that the three lands seen by Bjarni were Newfoundland, Labrador, and Baffin Island. 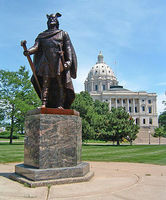 Bjarni made no attempt to visit or explore the lands he sighted but Leifr heppni Eiriksson, the son of Eric the Red, later bought Bjarni’s ship and undertook this task, discovering Vinland, which has been variously located in Newfoundland, the Atlantic Provinces, Massachusetts, and elsewhere. For discussion of the location of Vinland see Leifr. Johann S. Hannesson, The sagas of Icelanders (Islandica, XXXVIII, 1957). Hennig, Terrae incognitae II, 295fr., 311, 324, 342ff. ; III, IV, passim. Halldór Hermannsson, The northmen in America (Islandica, II, 1909). Oleson, Early voyages, 19–22; “The Vikings in America: a critical bibliography,” CHR, XXXVI (1955), 166–73. T. J. Oleson, “BJARNI, HERJÓLFSSON,” in Dictionary of Canadian Biography, vol. 1, University of Toronto/Université Laval, 2003–, accessed April 24, 2019, http://www.biographi.ca/en/bio/bjarni_herjolfsson_1E.html.